A critical and comprehensive examination of the origination and application of developments in the textile industry and its products, this book provides one of the only state-of-the-science reviews carried out in recent years. It covers the measurement of wool fiber properties, specifically those of raw wool. 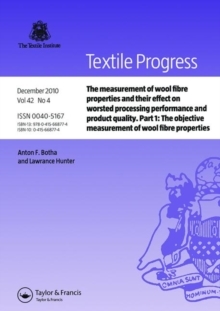 It also examines the release and wide acceptance of instrument and test methods for the most important wool fiber characteristics both cost-effectively and rapidly.